Following the conclusion of the FIA World Motor Sport Council meeting, the FIA World Rallycross Championship presented by Monster Energy has announced today a reduced 2019 calendar of 10 events, with the postponement of World Rallycross of USA which was scheduled to take place at COTA in Austin, Texas from 28-29 September. 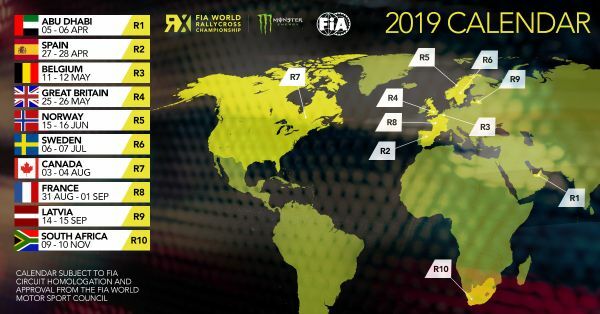 World RX Managing Director for IMG, Paul Bellamy, said: “After consulting with the FIA and our World Championship teams, we have decided to reduce the number of events in our 2019 calendar. This decision has been made to help control costs for the teams and ensure the series remains as competitive as possible. We remain very excited about the 2019 season with 10 high-octane events. Calendar provisional pending homologation of circuits and approval of the World Motor Sport Council.